FREE breakfast every Monday until 11AM. 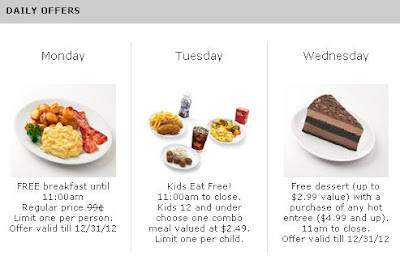 On Tuesday children 12 and under can choose one combo meal valued at $2.49. Offer valid from 11:00am to restaurant close. Limit 1 meal per child per visit. Child must be present. Offer valid December 26, 2012 – January 1, 2013.